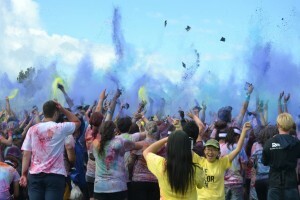 Volunteer for The Color Run through SVA! Once you’ve finished your run there’s still more excitement to come as you’ll be able to attend the Finish Festival. This is a chance to let your hair down and boogie the afternoon away, while throwing colour at everyone else! This year spaces in Christchurch’s Color Run are filling up fast (buy tickets quickly if you want to be a runner!). However, if you don’t want to be a runner UC’s very own Student Volunteer Army can make sure you’re still involved. Well luckily it’s pretty simple, just register online as a volunteer, and make sure you choose SVA on the second page when it asks what group you are arriving with. Previous PostWhat does diversity look like?Next PostWhat’s happened in the last week?